Prior to our beautiful weather this week, we had a weekend of rain. And by rain I'm referring to 6+ inches in 3 days. R-A-I-N, rain! 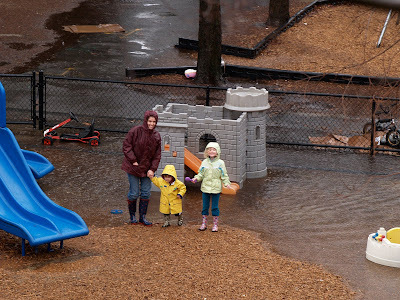 Our playground transformed into a pond or swimming pool, and Monday morning I couldn't resist taking the kids out in their (quickly rendered useless) rain boots to find the deepest puddles. Boy, did we find them! 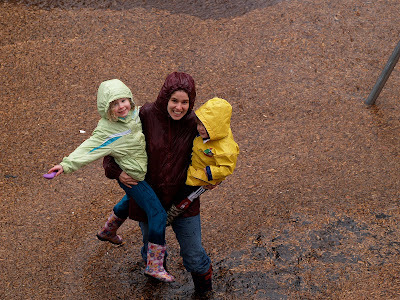 Our friend, Inka*, caught the action in photos from her balcony. Really, it's not too bad. it seems to be the most flooded. while Brian and I continued straight ahead. we rescued her from a park bench. 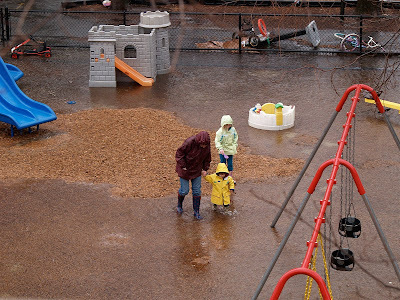 This picture best displays the depth of the water on that far end of the playground. You can just see the tops of my boots. 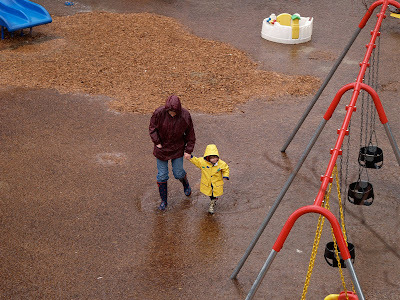 Even more amazing: the playground was mud-free the following day and many moms and kids were out enjoying the 50 degree weather and sunshine we'd missed having over the weekend! *All rights reserved on these photos. Please do not copy, unless your name is Inka, you love photography, you have two adorable children, you speak Polish, German, & English, and are my neighbor! Yes, Inka is one amazing woman. wow! those are some puddles! It was shocking to me too that we had so much rain, and all the dampness seemed to be gone Monday right after it stopped. Hurray for 65 degree days! You are such a good mom! 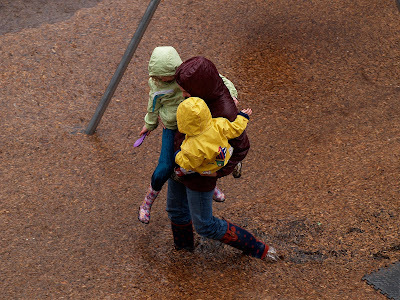 Your kids will remember the time you took them out to play in the puddles. FABULOUS! my facebook was filled with updates of monsoons and people cutting off their arms...oh wait, that was jenny's update. and it scared me a little. seeing pictures and your smiley kiddos makes it way less scary...thanks inka!